Am I a foodie or do I just have high expectations? What the hell is a foodie, anyway? Do we not all eat food? Mercadito (Chicago) Tequila and salsa flights with lunch. 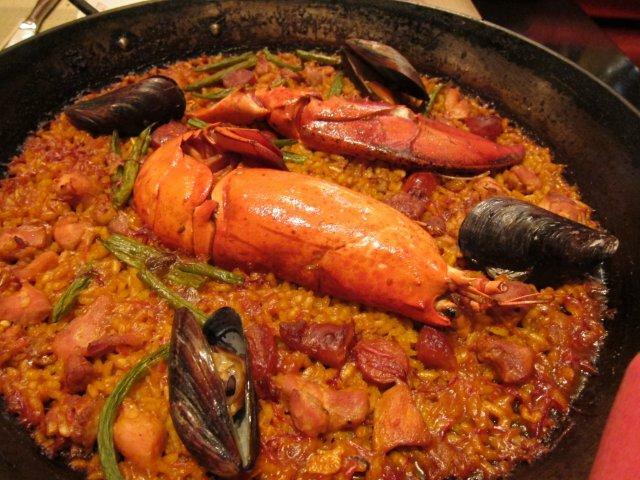 And then there are the slew of upscale Houston eateries: Brasserie 19, Hugo’s, Philippe, Stella Sola, Reef, Ibiza, Catalan (formerly), Bar Annie, Mark’s, Mockingbird Bistro, Glass Wall, Haven, Canopy, Ouisie’s Table, Tiny Boxwoods, and T’afia, and many many more. We have gotten into such a habit of eating beautifully on occasion that it is standard for GAD to keep his camera handy so he can photograph our food so it can last, literally, forever. But does this make me a foodie? What if I told you that I get equal (but different) delight from queso & chalupas from Tchapultapec, chicken fajitas from Pappasitos, fish sandwich & fries with gravy at Whataburger, and let’s not forget hamburgers. I LOVE hamburgers. The Counter. Little Bigs. Basically anywhere. Wouldn’t those simply (and inexpensive) delights make me an anti-foodie? I have come to be really concerned that we believe that good food = big cash. It’s just not the case. When the basic ingredients at most restaurants are the same, why is some food more flavorful? Or healthy? Or expensive? Of course, my business friends point out that solo chef restaurants have higher overhead expenses than, say, Chilis which leads to the mark-up, but I think that restaurants also taken advantage of people like me who think it’s okay to spend money on food that is unique, in a beautiful space, and treats me like a human being instead of a numbered table station. But wait – is that such a strange request? If we eat out shouldn’t we be able to enjoy healthy, well prepared food, in an environment that allows us to have leisurely conversations without spending all of our entertainment money at once? Should there be a special term for this? Perhaps I should live in Europe, but why don’t Americans deserve food as it was intended – a way for people to gather at the end of our day, to talk about our day’s work, to come together to complete something shared, and to satiate our basic hunger? Without going bankrupt and without having to eat fast food? I am lucky. Mid-thirties. No children. A job and a boyfriend who afford me the opportunity to eat at these amazing places. But what happens when my situation changes? No nice restaurants for me? It’s true, I should not eat Whataburger with fries & gravy but I also should not have to spend $100 for dinner. Where is the balance? Part of that is coming to the realization that I am going to have to cook more. And not cook crap food. I am going to have to be able to cook good food quickly and inexpensively. Yes, it is starting to take up some of my blog writing time, but it is starting to help me feel less suckered by restaurants and less likely to pick up something crappy when I know I can make better myself. Please note: this is not to say that I will be able to kick my fancy restaurant habit. In fact, JB is picking out someplace good for GAD and I to go to when we visit Miami next month. However, I could start looking at my kitchen as my own solo chef establishment. I kind of like that idea. As an example: Here is the vegan dinner I made last night. 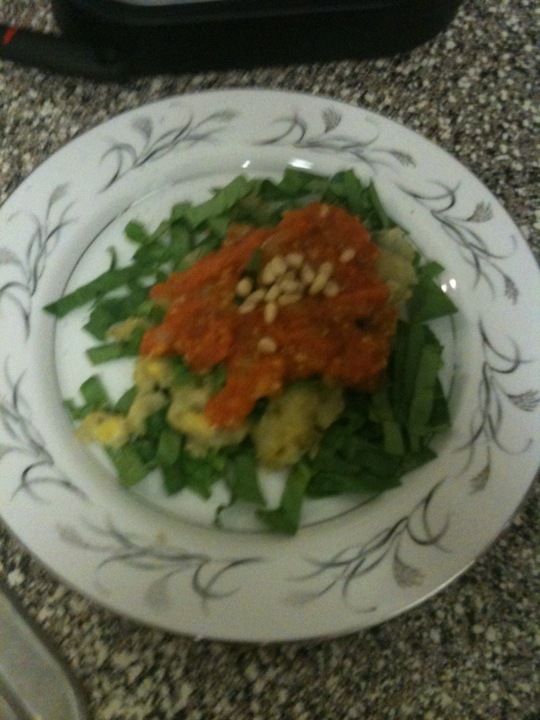 Polenta with fresh spinach and homemade simple tomato sauce topped with pine nuts. It was delicious!